When a person dies in an accident, their loved ones often seek help from a Long Beach personal injury lawyer in to recover damages for their losses. People sometimes have misconceptions about wrongful death lawsuits, the types of damages they might be able to recover and about who is able to file a wrongful death lawsuit. In order to better help people who have gone through such a terrible loss, the Long Beach personal injury lawyers at Russell & Lazarus APC have compiled some information explaining wrongful death lawsuits, the kinds of damages that may be recovered and the people who are able to sue. When a person is killed due to the wrongful actions or negligence of another person, their estate or survivors may file a civil lawsuit against the person whose actions led to their death. California law defines who is able to file such a lawsuit in the state. Long Beach personal injury lawyers will also make certain that the lawsuit is filed within the time period prescribed by the statute of limitations. The damages that are available through a wrongful death lawsuit are divided into two different time periods. The first category includes damages that arose after the accident and up until the time of your loved one’s death. Such damages may include their medical expenses incurred as a result of their injury, pain and suffering they endured, any wages they lost and their reasonable funeral and burial costs. The second time period covers losses experienced by the person’s family members after their death. Such losses may include the person’s income that would have otherwise benefited their family up until their retirement age. Under California law, family members may also recover for loss of consortium damages, which are for the loss of your loved one’s support, love, guidance and affection. Who Is Allowed to File a Wrongful Death Lawsuit? The law defines who can file a wrongful death lawsuit in California. They may be filed by the person’s spouse, child or domestic partner. If the person does not have any spouse, domestic partner or child, then the lawsuit may be filed by anyone who would stand to inherit from the person through intestate succession, including their parents, stepchildren, their putative spouse or that person’s children if they were financially supported by the person who was killed. When the jury decides the damages to award to each person, they will consider the person’s relationship with the decedent as well as other factors in the accident. If you are the spouse or domestic partner of the person who died, you may be able to recover for the loss of their companionship and affection. If you are the child of the person who died, damages may include money for the loss of your relationship with your parent. If you are the parent of a child who was killed, you might be able to recover for your pain and lost relationship. California law allows punitive damages in certain cases, too. When you have suffered the loss of a loved one due to the negligence or intentional actions of another person, you may want to get help from an attorney who accepts wrongful death cases. An attorney may be able to help advise you regarding your loved one’s case and file the lawsuit for you. 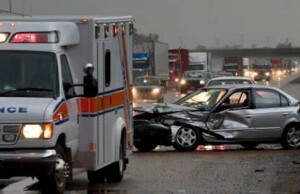 To speak with a Long Beach personal injury lawyer at Russell & Lazarus APC, call (949) 851-0222.